Global on the go breakfast products market expected to reach approximately USD 1,699 million by 2024, growing at a CAGR of around 4.32% between 2018 and 2024. 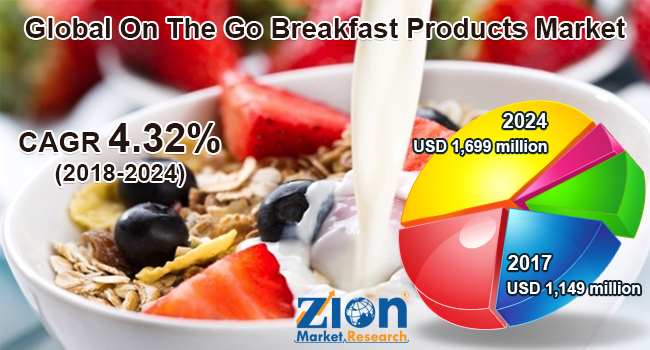 Changing lifestyle patterns, food habits, and busy work schedules of people globally are anticipated to fuel the expansion of on the go breakfast products market globally. The report covers a detailed analysis and forecast for on the go breakfast products market on a global and regional level from 2015 to 2024. The study offers historical data from 2015 and 2017 along with a forecast from 2018 to 2024 based on revenue (USD Billion). The study comprises a comprehensive view of the market with the review of market drivers, restraints, and opportunities. It also provides the impact of drivers and restraints on the on the go breakfast products market between 2015 and 2024. The study includes a detailed competitive scenario and type portfolio of the key vendors. The report evaluates Porter’s Five Forces model to analyze the different factors affecting the growth of the on the go breakfast products market. Moreover, the study encompasses a market attractiveness analysis, which provides the most attractive and least attractive market segments information by product, packaging, distribution channel, and region. The report includes detailed segmentation of on the go breakfast products market based on product type, packaging, distribution channel, and region. Cereal meals, breakfast bars, sandwiches and burgers, bakery products, sausages and salamis, egg meals, beverages, and others are the key product types in the on the go breakfast products market. On the basis of packaging, the market can be classified into films and wraps, pouches and sachets, rigid boxes, bottles and jars, cans, and trays. On the basis of the distribution channel, the market can be classified into hypermarket/supermarket, convenience store, specialty store, and e-commerce. Major regional segment analyzed in this report include North America, Europe, Asia Pacific, Latin America, and the Middle East and Africa with its further bifurcation into major countries including the U.S., Germany, France, UK, China, Japan, India, and Brazil. The report provides a detailed competitive outlook including market share and company profiles of the key players operating in the global market. Some of the key participants in the report include Sanitarium Health and Wellbeing Company, General Mills, Alara Wholefoods Ltd., Amy’s Kitchen, Baggrys India Ltd., Country Choice, Kelloggs, Nature’s Path, Nestle, Raisio, Uncle Tobys, MOMA, Weetabix, and Quaker Oats Company.